Are you tired of buying a new set of golf ball after every few rounds of golf? Unhappy to see your golf balls losing color and becoming dull? Or is your game getting affected when you play with dirt laden and mud coated balls?An unclean ball often results in reduced spin and lowers the range the ball can fly. On the other hand, playing with clean and shiny balls enhances the output of the game. Clean golf balls don't just look better; they're also easier to find when they are hit on the greens, fairways, in the rough, or even in a sand bunker. Like any other outdoor sports equipment, even golf balls are bound to get dirty with regular use. The point in concern that arises for all golf players is finding a nice, simple and quick way as how to clean dirty golf balls in the best possible way. If the course that you play on provides a golf ball washer, it makes sense for the judicious golfer to spare some time and the sensible golfer will take the time both during a round at the course-provided ball-washers and at home to clean golf balls. That will rinse the balls which can later be washed clean following some simple steps at home. I think the best way to deal with unclean golf balls is to clean them yourself. Once you find an easy solution for cleaning I’m sure the task can be completed in just a short while This will not only save you a lot of money, you will be happy when you see the positive effect it has on your game too. Golf balls can be cleaned quite easily with the help of a few cleaning agents. Choose a golf cleaning agent depending on how dirty the ball is. There are different kinds of dirt, stains or marks that can make a golf ball dirty or unclean. Many home solutions are convenient cleaning solvents that include undiluted bleach or ammonia, white vinegar and the very simple dishwashing liquid that is always readily available at home- and this is one of the quickest and cheapest cleaning options. This is the most common cleaning agent found in every house. It is the gentlest and the safest cleaning agent you can use for cleaning golf balls. Though acidic in nature, this is a relatively harmless but effective solvent that acts as a good cleaning agent. It is not very expensive and does not cause any damage to the balls or the cleaning equipment. White vinegar is environment-friendly too. The best thing to use to get shiny, sparkling white golf balls is liquid bleach. 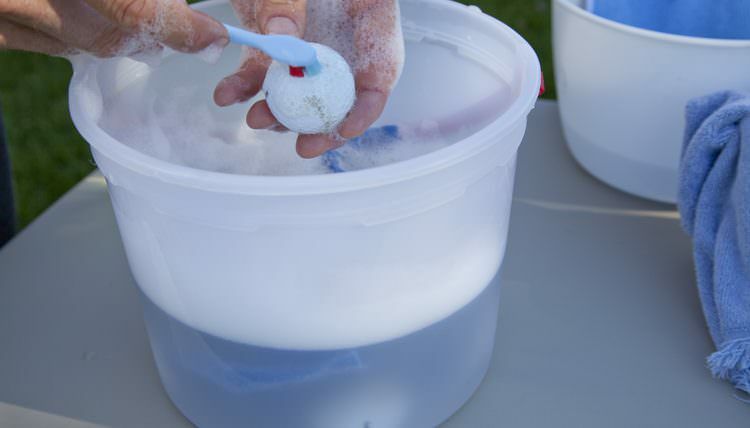 Just by submerging dirty and discolored golf balls in a solution of liquid bleach will cause a reaction on the external surface and make the ball look whiter and bright. Ammonia is a common cleaning agent used to clean stubborn stains and remove dirt from different surfaces. Cleaning golf balls using an ammonia solution is a sure shot remedy to get clean and sparkling white balls. To scrub and gently remove dirt from the surface of the balls, certain soft bristled brushes and nylon scrubbers will be required. Make sure that the texture of the brushes and scrubbers are not too hard and abrasive otherwise you may end up damaging the surface of the balls and causing more damage than good. A ready water supply where the water comes out with good pressure is a great help in cleaning dirty balls. All you need to do is connect the water hose to a faucet and direct the forceful water on the balls to remove mud and other particles like grass or sand that may be embedded in the caked mud. A bucket, tub or even a kitchen sink is a good place where you can wash your balls under water pressure and leave them to soak for a while. Once the balls are washed, you need dish towels or any soft cloth to wipe the balls dry so that do not gather fine dust over them. This is a very handy home equipment that can clean all your golf balls in a jiffy. Just make sure that the dishwasher is completely empty and does not have any dishes, crockery or cutlery in it before you put the golf balls in. There are several methods for cleaning golf balls easily using the above materials. Go through these step by step instructions and choose a way that suits your requirement the best. If you don’t mind your dishwasher being used to wash golf balls, it is quite a nice and effective way to clean golf balls. Just make sure that before you pop in a bag load of balls ensure that they are free from dirt and other superficial debris like dried grass or mud. 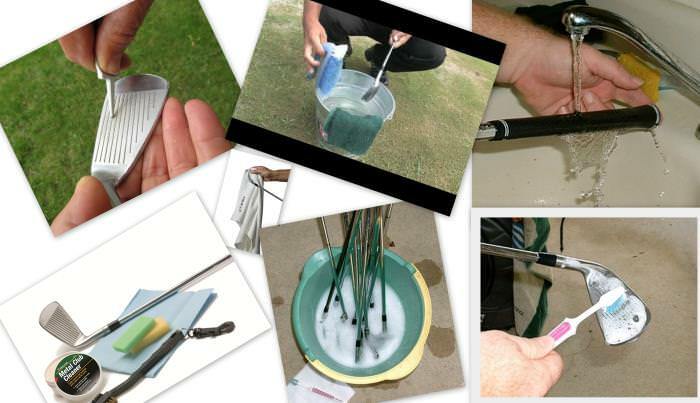 Give them a nice hot water spin and voila you have your golf balls looking as good as new. Pour sufficient dishwashing liquid in the detergent compartment of your dishwasher. Put the golf balls into the dishes compartment. Set the dishwasher on the presoak mode and allow the golf balls to soak for a couple of minutes. Let the cycle continue and be completed. Take the golf balls out to check if they are clean. If you still feel that there is some more dirt on the balls, it is recommended that you let them get washed for another cycle. This cleaning technique is suitable for golf balls which are not very dirty. This method is also quite simple. You need to find a bucket, tub or even your kitchen sink is a good place to let the balls soak in. Drop the balls into the chosen container and fill it with hot water. Now chose your cleaning solution. You can choose either household ammonia or white vinegar. Any one of them will clean the balls well. Depending on the number of balls you plan to clean pour in some liquid and let the balls soak for about half an hour. Transfer the balls into another container filled with clean water and rinse them clean. If you find any caked mud or dirt gently use a brush or scrubber to ease the dirt particles out. Rinse and dry the balls on clean towels. You can thereafter sun dry them for a couple of minutes too. This method is suitable for moderately dirty balls and you can wash a big load of golf balls in one go. This method is particularly useful for golf balls that have been retrieved from ponds or water bunkers. Even balls which are found after long periods of time tend to have caked mud, slime and are coated with other sticky stuff. Run a water hose over the balls in a big container and try to dislodge the stuck particles. Once they are partially clean use a paste of baking soda and water and a scrubber or a brush to gently remove the grime from the surface of the balls. Again, give the balls a good rinse. Let the balls soak in this solution for at least an hour. Towel dry them followed by sun drying for a few minutes. This method is recommended for very dirty and unclean golf balls. Sometimes golf balls need to be marked with permanent markers or paint for identification. They may also get badly stained and discolored due to constant exposure to external elements. For such balls, a little extra treatment is required to get them cleaned properly and make them sparkle and shine once again. Depending on the kind and amount of dirt the balls have accumulated you can use any of the above methods to clean the balls and make them dirt free. If the marks still persist then you need to get hold of some acetone or even a nail paint remover will do. Dip a piece of cotton into the solution and rub it well on the paint or permanent marker marks. Dip these balls in a solution of dishwashing liquid soap and hot water and allow to soak for a while. Rinse with clean water and pat dry on fresh towels. Leave in the sun to dry out completely before storing. This method is good for the removal of old and stubborn stains and even is useful in the treatment of slightly discolored balls. Here are a couple of extra tips and suggestions for quick, better and easier cleaning of your golf balls. Soaking in moderately hot water in all the soaking steps works extremely well in thorough cleaning of the balls. Just remember not to soak for too long or the basic outer structure and the internal properties of the golf balls may get damaged and ultimately affect the quality of your game. Sort out the balls according to their level of dirtiness. All the balls need not go through all the processes of cleaning. Once the segregation process is done begin the cleaning process. Try as far as possible to clean an entire load of balls at once. Do not leave golf balls uncleaned for long periods of time. Cleaning freshly dirty balls is much more fast and quicker, compared to balls which not been cleaned since a long time. 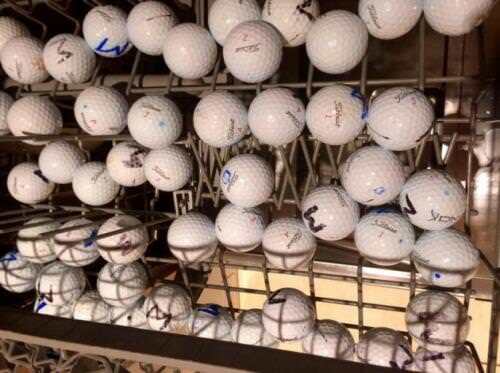 If possible, clean the balls whenever you get time on the course. Once you leave them long with dirt, the particles dry and stick to them. Keep a spare damp cloth handy with you in your golf bag especially for this purpose. In case you want to do away with some old golf balls that you could not get back to their almost original look, such balls can be resold and given for refurbishment. Since we all are environmentally conscious and eco-friendly people on earth who need to do our bit to protect the environment- giving away such balls for refurbishment is a great idea. I hope you enjoyed the tutorial and are now relieved that your problem of cleaning golf balls has been sorted out. By self-cleaning your dirty golf balls, you have done yourself a big favor and not only saved yourself a lot of money but you have done your bit for the environment too. After following this step by step tutorial, you are now better than a professional in churning out clean, shiny and as good as new golf balls. Since most of the materials required for cleaning are more or less already available in your homes or if not they can be very easily purchased at your neighborhood hardware store. Once cleaned, the golf ball will be much lighter and brighter too. This clean, shiny and bright ball can now be easily visible from a distance, and you won’t need to waste much time in locating and searching for your balls. Also, due to the clean texture, its flying abilities will also be much better and will allow you to have a wonderful and trouble free game. So, enjoy your next round of golf with clean, spotless, aesthetically pleasing and functional golf balls. Do let me know if these tips were helpful to you in the comments section below and if you have any personal tips that you would like to share with our readers we will be happy to share your experiences. If you liked the article and have benefitted by the cleaning tips, please do share it with your family and friends.